Using his experience as a telegrapher and tinkerer, the young (22 year old) Thomas Edison had invented and patented the ticker tape machine, and he was in the office of an executive that he hoped to interest in buying it. He was thinking of asking $3500 for the machine, but was hesitant, since he had no college degree and this was his first attempt to sell an invention. Instead of asking for $3500, he asked what the executive wanted to pay for it. He said $40,000, which Edison accepted. He used the money, which would be closer to $1,000,000 in todays dollars, to start a research facility at Menlo Park, and his career as a professional inventor was launched. 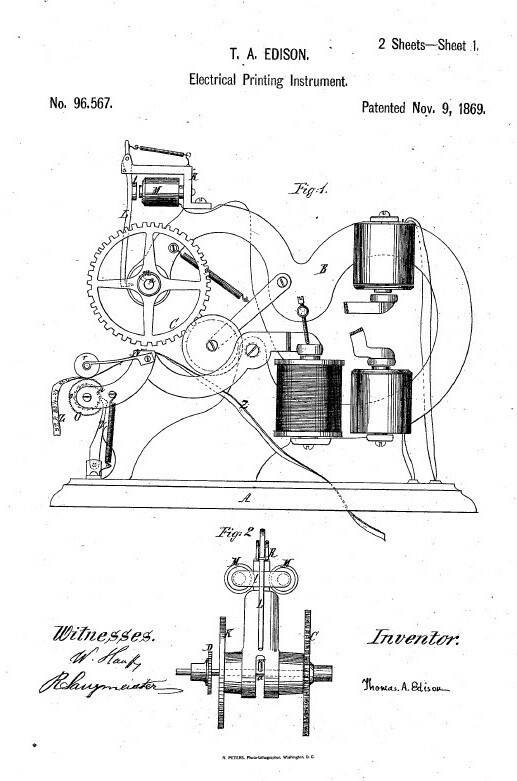 This was U.S. patent number 96,567, shown below.